I'm actually going to do an experiment! Last week I went to Philadelphia, to give a talk and spend a few days working with the former postdoc on the toxin-antitoxin manuscript. This manuscript has a former Honours student as first author; it's has been languishing for most of the past two years, with a few spurts of progress. Until now we have been thinking that the toxin protein was not broadly toxic to cells, but somehow only prevented them from taking up DNA. How it could do this was very puzzling, because our RNAseq analyses showed that the competence gene transcript levels reached normal levels under competence-inducing conditions. The main evidence for lack of toxicity was that the antitoxin mutant grows normally in rich medium, which it shouldn't if the toxin is harmful to growth or viability. This mutant produces high levels of toxin RNA during growth in rich medium, and because there is no antitoxin present, the resulting toxin protein should be able to interfere strongly with growth. But it doesn't. 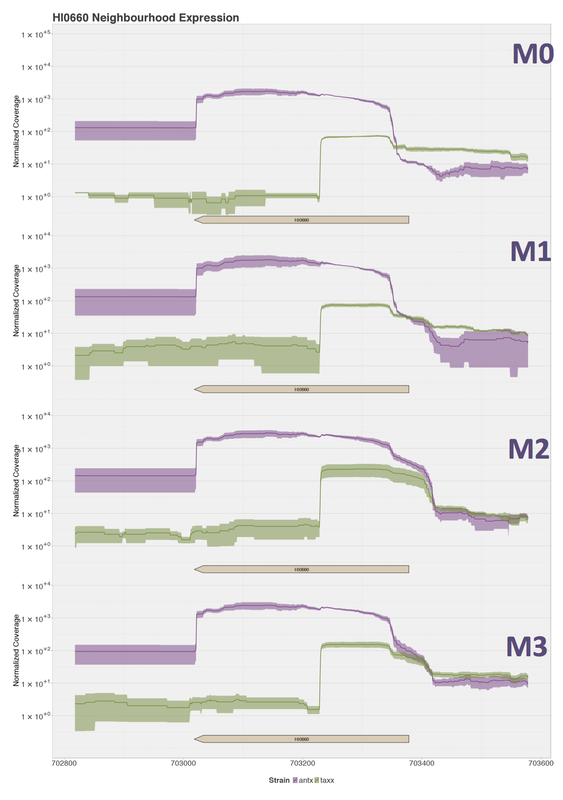 But we discovered that this interpretation is wrong, by looking at the coverage profile of the toxTA operon in wildtype and ∆toxA cultures. 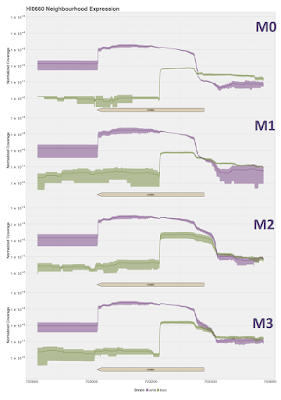 The figure below shows the normalized read coverage of the toxTA region in wildtype (purple) and ∆toxA (green) cultures, in log phase growth ('M0') and after 10, 30 and 100 minutes in the competence-inducing medium MIV ('M1', 'M2', and 'M3' respectively). No, these are not the right graphs. I need to go back to the R scripts the other Honours student left me with and create the right graphs.